The 46th annual Christmas in Christ Chapel worship services take place November 30 through December 2. Gustavus Adolphus College’s 46th annual Christmas in Christ Chapel worship services will take place Friday, November 30 through Sunday, December 2. Tickets for this year’s services are sold out, but a free livestream will be offered during the Saturday evening performance beginning at 7:30 p.m. The theme for the 2018 service is “Visions of Divine Mystery.” The Christmas story is presented through music, scripture, readings, dance, and visual arts that consider how God has been visible through angels, prophets, and the birth of Jesus, as well as how God continues to work in ways that may be visible or mysterious. 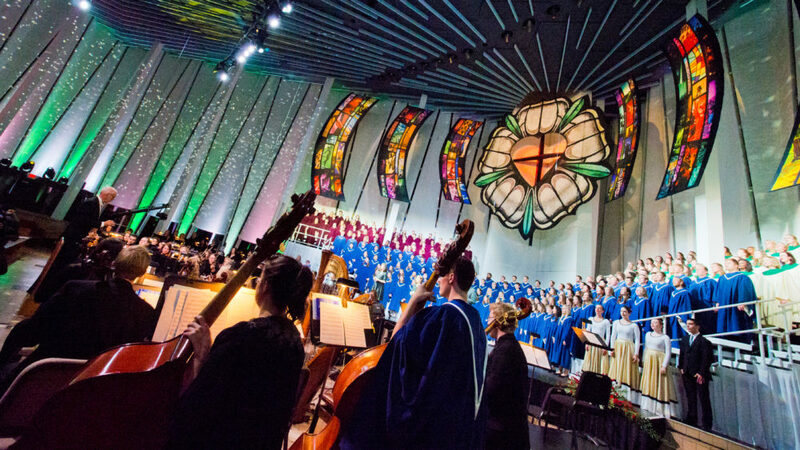 Set against the backdrop of the shimmering aurora borealis, the worship services are also a celebration of the careers of two longtime music faculty members: Michael Jorgenson, who serves as a soloist in this year’s services, and Gregory Aune, who has led the Gustavus Choir for 24 years and serves as the the 2018 Christmas in Christ Chapel artistic director. Christmas in Christ Chapel will again be streamed online to the public on Dec. 1 beginning at 7:30 p.m. Heroic Productions, which annually provides audio, video, and lighting solutions for both Christmas in Christ Chapel and the Nobel Conference, will produce the live stream after winning a Hermes Awards for 2016 and 2017’s Christmas in Christ Chapel broadcasts. Sunday, Dec. 2 at 3:30 p.m. and 7:30 p.m. If you plan to watch the free livestream of Christmas in Christ Chapel on Saturday, Dec. 1, you can access the video at gustavus.edu/CinCC. The Gustavus Hill Crew is sponsoring a hats and mittens drive during Christmas in Christ Chapel. Donations will be collected in Christ Chapel during the entire weekend. Please bring in new or gently used hats and mittens to be donated to Minnesota-based nonprofit Hats and Mittens. *Visions of Divine Mystery will be available on TPT.org beginning Dec. 21. A tradition since 1973, Christmas in Christ Chapel is a time for the Gustavus community to celebrate the holidays with one another. Approximately 350 students, faculty, and staff bring the program to life each year through the use of music, dance, spoken word, and the visual arts. A new theme is chosen each year in order to educate participants and audiences alike about faith and theological traditions. Choirs and orchestras lead the five services, with approximately 1,100 people attending each one.